Barley is an annual cereal grain used for livestock feed and forage, as well as for malting. Barley cultivars are available for fall or spring planting. Spring-seeded barleys are commonly planted in Midwest areas where well-drained, fertile soils provide optimum production. Barley grain can be arranged in two-rows or six-rows and hulled or hull-less. These different barley varieties result in various growth rates, feed intake, and feed efficiency. Two-rowed barley produces fewer, but larger kernels per plant than six-rowed barley, so it generally has better-feed efficiency, but lower grain yields per acre. Hulless barley has higher crude protein and lower crude fiber than hulled barley, as the hull contains a large portion of the fiber. Barley has a similar nutrient profile to corn making it a versatile feed grain. Compared to other small grains, barley has a lower metabolizable energy (ME) value than rye and corn. Like oats, barley has higher fiber content than other small grains because the kernels are encased in a hull. Barley contains more phosphorus, with a higher bioavailability than other small grains; reaching 20-30%, while corn bioavailability is 10-15%. 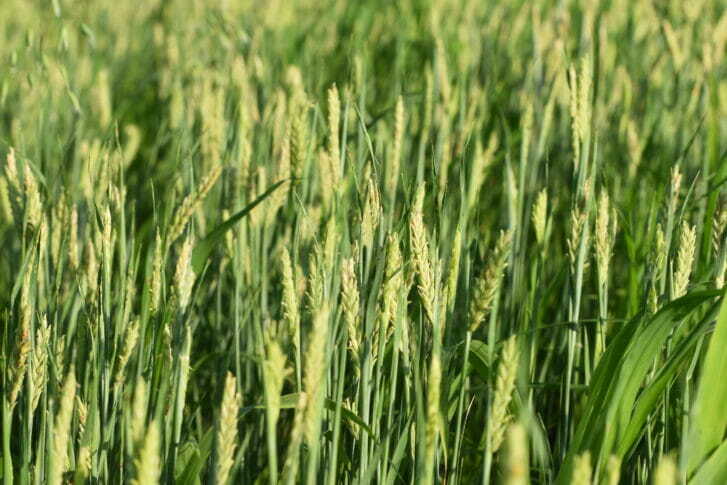 Barley is well suited for grow-finish rations since feed intake is not a limiting factor and pigs can perform as well as they do on corn-based diets. Feeding Small Grains to Swine reports the high fiber content of barley does not negatively affect gains in growing-finishing pigs, and found pigs fed barley-based diets tended to have a higher quality fat than those fed corn-based diets. Even though barley-based diets are lower in energy than corn-based diets, pigs can meet their energy requirements by eating more. Farmers like Ron Rosmann of Harlan, use barley in combination with other small grains like oats, wheat, triticale, and field peas to feed succotash. Read about the feeding trial Ron conducted here, Feeding Trial: Succotash Swine. In the video below, Ron, Dan and Torray Wilson of Paullina talk about growing succotash for livestock. Barley can also be used as the sole cereal grain in sow diets during gestation. However, barley’s low energy density limits its use to 85 percent in lactating sow diets and 25 percent in weaning pigs’ diets. The recommended inclusion rate for barley in starter diets is less than 25 percent due to barley’s high fiber content. Starter pigs’ growth performance may be challenged when feeding barley due to its lower energy content. The fiber in barley has a prebiotic effect reducing diarrhea incidences for starter pigs. Compiled from the Tri-State Swine Nutrition Guide and from Iowa State University extension nutrition guide. How much should you pay for barley? The value of small grains should be based on their nutrient contribution to the ration regarding digestibility and costs. The current going price is $3.27/bushel for corn and $4.53 /bushel for barley. 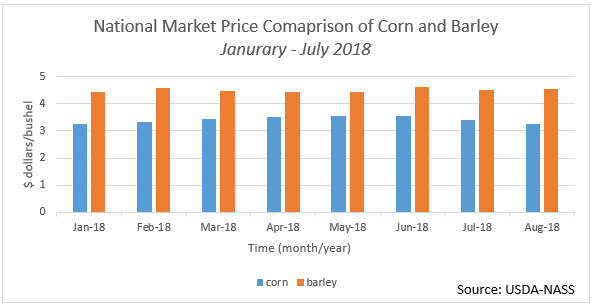 From January to July 2018, barley has been on an average $1.09 more than corn. The table above highlights finishing pig rations; one with a high inclusion rate of barley (90%) and the one with a low inclusion rate of barley (25%). The relative cost of the two high and low rations, based on current market prices, is shown in the table below. The table above highlights gestating sow rations with and without the inclusion of barley. From the two rations compared, the relative cost of corn and barley based on current market prices is shown in the table below. What is the cost of purchasing barley? Albert Lea Seed in Minnesota carries both conventional and organic varieties. 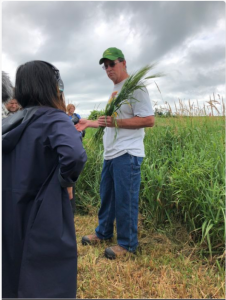 For Albert Lea’s Robust barley variety, conventional seed is priced at $9.50 per 48-pound bag, and organic seed is $20 per 48-pound bag. 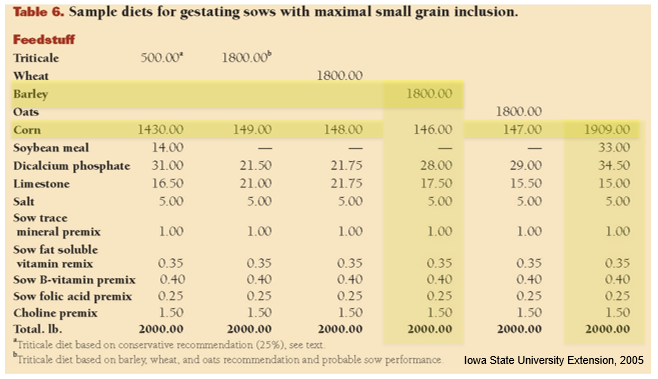 A recommended seeding rate is 90 to 100 pounds per acre, therefore costing between $19 and $40 per acre. Dan and Lorna Wilson of Paullina, conducted a 1995 on-farm research project determining the economic differences between a corn/soy ration and corn/barley/soy ration. Read the report here, Barley Versus Corn Based Hog Rations. Stay tuned for our next blog in this series – Small Grains, Large Gains: Feeding Wheat to Pigs.